As soon as I saw the sketch I knew it was my opportunity to make a layout with my favourite photo from Nikola's christening. It captures my favourite moment from the christening. When poor little thing, exhausted from the double christening (we just had his cousin's Andreas before his) rest his head on my shoulder and fell asleep. I literally felt my heart melting... my little love!!! So when I saw the photos from the christening, I was so thrilled when I saw this photo! Nikolas sleeping, (my face expressing how much I was suffering from the high heels, lol!) and his parents in the background smiling. What a great photographer!!!! I could have done without the red blouse in the background... but I don't have photoshop! The turquoise paper was a bit too loud for the photo, so I used a bit of gesso to tone it down. I coloured the wooden embellishments with promarkers. I hope you like it! 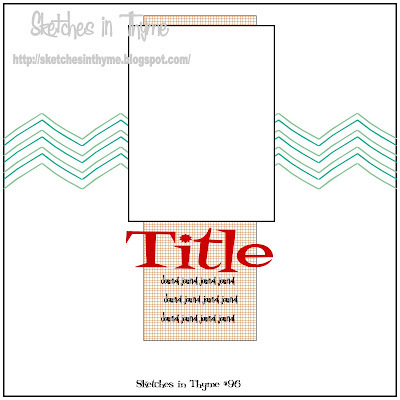 Come over at Sketches in Thyme to see how the design team has used the sketch and to play along with us!